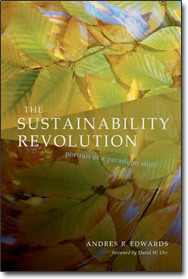 Selected by Apple to demonstrate the educational potential of ebooks used in conjunction with the iPad platform in academic settings, The Sustainability Revolution provides a comprehensive primer on the history, evolution and future of the movement toward sustainability. Sustainability has become a buzzword in the last decade, but its full meaning is complex, emerging from a range of different sectors. In practice, it has become the springboard for millions of individuals throughout the world who are forging the fastest and most profound social transformation of our time, the Sustainability Revolution. The book analyses sustainability as defined by each of these sectors in terms of the principles, declarations and intentions that have emerged from conferences and publications, and which serve as guidelines for policy decisions and future activities. Common themes explored include: stewardship, economic restructuring, respect for the principles of nature and an intergenerational perspective on solutions. Concluding that these themes in turn represent a new set of values that define this profound transformation, The Sustainability Revolution describes innovative sustainable projects and policies improving the lives of people in Colombia, Brazil, India and the Netherlands and examines future trends. The first book of its kind, it will appeal to business and government policy makers, academics, and all interested in sustainability.